Try our Chrysoberyl Specimens Satisfaction Guarantee - compare our prices and our superior quality. 0.75" x 0.7" x 0.6"
This chrysoberyl crystal is translucent to semi-transparent and has yellow-green color. 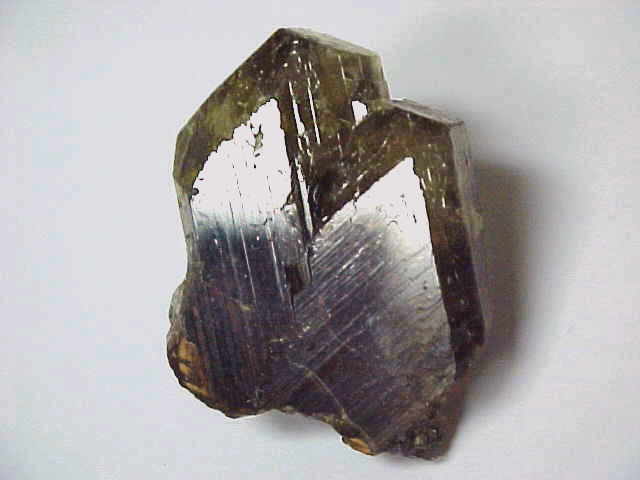 It has very good quality terminations, and shows multiple twinning (also known as "trilling" in chrysoberyl), giving this specimen a pseudohexagonal form. 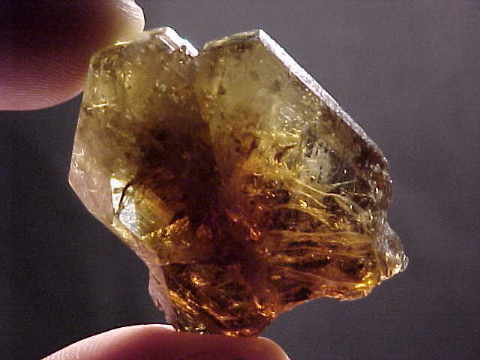 0.9" x 0.75" x 0.7"
This chrysoberyl specimen is actually several intergrown crystals that are translucent to semi-transparent with some small gem-grade areas. The terminations are in very good condition, and each of the crystals shows evidence of multiple twinning or "trilling". 1.65" x 1.15" x 0.6"
This fine quality chrysoberyl specimen is a V-shaped twinned crystal that is semi-transparent to transparent with many small gem-grade areas. It has tabular form, and the terminations are in good condition, with color zones ranging from greenish-yellow to golden-brown. See also a view showing the twinned surfaces, and a view showing the transparency. 3" x 2.6" x 1.7"
This large specimen of natural chrysoberyl is translucent to semi-transparent with yellow-green color. It has some areas with faint chatoyancy or "cat's eye", and its surfaces are slightly stream-rolled with some terminations showing. This chrysoberyl piece is very rare due to its unusually large size and translucency with chatoyant areas. It would make a very unique carving, or it could be made into two spheres measuring 1.1" and 1.4" in diameter. This is the end of our Chrysoberyl Mineral Specimens and Crystals virtual gallery page. See also our mineral specimens page for the color change chrysoberyl variety Alexandrite. To see more chrysoberyl photos, just select another item category from the table below. To see photos of another mineral variety, select any item category link in our Mineral Inventory & Factsheet Index. Would you like us to inform you when we add on this page more natural chrysoberyl specimens? We do have additional inventory of natural chrysoberyl items in stock, so be sure to let us know if you have any natural chrysoberyl special requests. Please contact our webmaster or our 'site' geologist with any questions or comments.